Damodar Kunda lake is one of the important place lies near the shaligram place muktinath or gandaki.. There are also many saligram in damodar kunda . As well as many devotees also offer saligram here in kunda (holy lake). It is said that while going damodar kund we should take some shaligram with us from muktinath and must keep few inside this sacred lake damodarkunda. Offering saligram here in damodar kunda have its own importance to every one who visit here. So damodar kunda lake contains many saligram whose comes from various devotees who visit this sacred site. The meaning of damodar kunda is ,kunda dedicated to lord damodar(lord krishna/vishnu). Lord vishnu reside here in form of damodar (saligram). So many install shaligram(vishnu) inside lake while visiting here. Many peoples also do shraddha here (Ritual prayer and worship for ancestors). Kaligandaki river and Muktinath is main place where saligram is found. Except kali gandaki river and muktinath saligram is not found in other place. Kali gandaki river and Muktinath is situated in Nepal. This Place is holy and godly land. 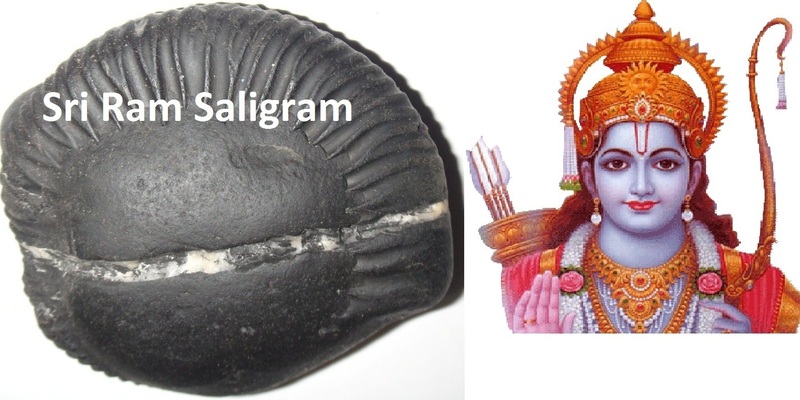 In case if we find similar stones like saligram in other place ,they canot be important like saligram. Because saligram place Gandaki river and muktinath Nepal is even described in religious Scripts and Books. As well as nepal saligram have chakra(beautiful emblem) in it. As well as it is different structures in shapes,sizes. And nepal saligram is mostly light or dark black /blue in colour. It is believed that, Lord vishwakarma reside in kaligandaki river with mercy of lord vishnu. He makes beautiful design on Sri saligram . So saligram have have beautiful chakra and wheel in it. Lord vishwakarma is lord of arctitects in hinduism. Lord vishnu Once again say to Lord vishwakarma " Hey vishwakarma, You live in krishna gandaki (kali gandaki) in form of bajrakeet insect (insect of water which bites stones) and make different symbol,chakra,to my murti saligram . Lord vishnu (Narayan) also speaks to Mother Earth , "Hey Prithvi i reside along with Laxmi in this place". The importance of gandaki river and muktinath is incountables. Near the saligram stones place in muktinath and kali gandaki river there is also famous temples of Muktinath. Lord muktinath is important place to all hindu. Many Sri Vaisnav from india also comes Nepal muktinath temple every year. They consider muktinath as one of the main temples among their 108 temples. Muktinath temple of lord vishnu and shiva is also important to buddhist. Buddhist worship as their god. And hindu worship as god vishnu and shiva. Muktinath comes from two place. Mukti + Nath. Mukti means salvation and Nath means who provide it.Muktinath is god of salvation. Worshipping to muktinath is believed to get salvation from illusory life and material world.